Pink is the new black. : ... And BOY are my arms tired! ... And BOY are my arms tired! There has been a lot of confusion, support, misunderstanding and listening when it comes to people asking me about my ongoing medical troubles with my arms. I thought I'd just put this down here to clear up any mis-understandings, as well as be slightly preachy about any of you with computer desk jobs to watch for the warning signs. I have a condition called cubital tunnel syndrome which is defined as chronic compression of the Ulnar nerve (commonly known as the "funny bone") at a bone channel which allows the nerve to travel over the elbow. In layman's terms, my ulnar nerve (most likely due to irritation from repetitive use) does not stay in the protective channel of bone that most people enjoy preventing them from hitting their "funny bone." When my elbow bends more than 90 degrees, I feel a "pop" in my elbow, which is the nerve popping out of the channel and sliding across the outside of the elbow bones. Do this a few hundred times each day, or lean your elbows on an unprotected nerve while bent, and you've got a recipe for disaster. I finally went to a specialist (after years of going to a general physician and being told to wear a wrist brace at night and take prescription anti-inflammatory meds), and he diagnosed my condition within 30 seconds. Like most other people in tech, I assumed the more common "carpal tunnel syndrome," which compresses the median nerve at the wrist. Many folks in tech acquire carpal tunnel, so I kept getting brushed off by general physicians. I have been in and out of Doctor's offices for about 6 years with reports of arm pain. Turns out, when you damage a major nerve in the arm (there are three), you get pain everywhere in the arm and hand, not just where the nerve is damaged. This makes it difficult for a non-specialist to give you the right diagnosis. For me, it feels like I have advanced arthritis in my right hand, shooting pains that travel from my elbow to the bottom left of my hand, "pins & needles" or numbness in my pinky and ring finger, phantom "burning" sensations in the fingertip of my pointer finger, pain in the back of my hand and stiffness in the wrist. PHEW! In other words, my whole arm is super janky right now. Oh, and here's the kicker... There is a threshold for damage to this nerve, after which it becomes non-repairable. 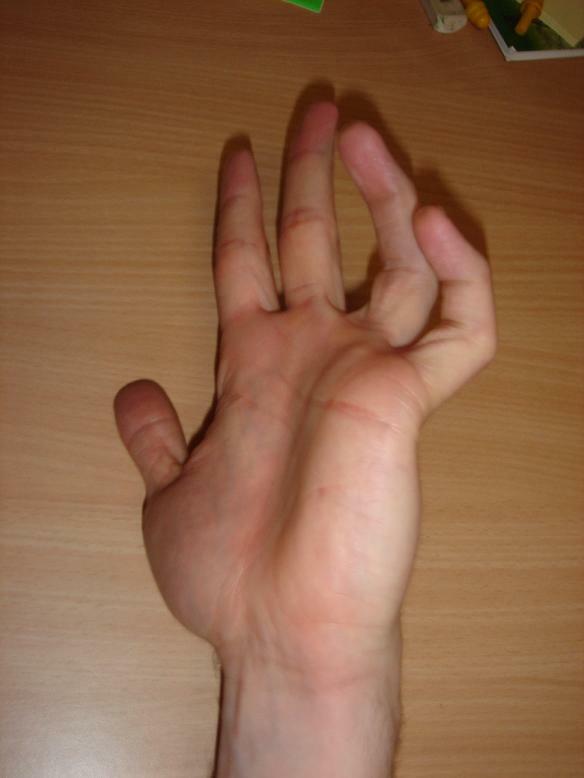 Commonly (or not-so-common anymore) referred to as the "ulnar claw." This is when there is so much damage, you lose the ability to control your pinky and ring finger altogether. This is not repairable by modern medicine. Finally figuring out what I had, it was immediately recommended that I go on leave and start physical therapy and behaviour modification to try craft a non-surgical strategy. I took 6 weeks off of work (most of October 2009) and went to physical therapy twice a week which included exercises, behaviour & sleeping mods, heat therapy and a form of painful massage called myofascial release. I also had to endure a study called "Nerve conduction study" to determine exactly how much damage was already done to my nerve. The test measures how quickly your nerve conducts electrical signals as they literally travel from one end of the arm to another. It's dreadfully painful and unpleasant, because they need to stick acupuncture-style needles deep into your muscle tissue in order to measure the interior conduction. That's after they use a mini tazer on you to determine your exterior conduction. Trust me... you definitely DO NOT WANT! After my 5.5 weeks of leave, I came back to work with more reasonable hours and an adjusted desk setup. But my arms continued to get worse. I also had an MRI on my elbow... which was an experience in an of itself. Especially for a claustrophobic like me. (Pro tip: I tried to sing all the lyrics to any song I could think of to get my mind off the fact that I was strapped into a tiny aluminum tube with no way out). I've decided after feeling my symptoms slide even further that I'm going to pursue surgical repair to prevent more damage. My doctor is going to cut a 3-4" hole in my elbow and move the nerve to the interior part of my elbow away from the bone. Let's be honest. I'm scared shitless. I hate anything related to doctors, hospitals, surgeries and the like. Terrified actually. Try to come near me with a syringe and I'll sprout wings and fly away. So I'm nervous about this again. Terribly nervous. I'll be out from work again for 6 weeks. 1-2 weeks of complete immobility, then strengthening and moving the muscles and nerve with the help of physical therapy. I know people have had much worse done, but it's hard to keep that perspective when your body is about to be cut open for all the world to see. My surgery is two weeks from today. My doctor is top-notch. My work is super supportive of my leave and getting better. My boyfriend is the best and is going to care for my one-arm-ness for several weeks. My prognosis is a sliding scale from: "It will stop getting worse." all the way to: "All your pain will be gone in a few months time." I have no gauge for how this will go. So please. Take 1 hour out of your day and go to an upper extremity orthopedic specialist and get it checked out. Or every time I see you henceforth, I'll show you my scar. Wow, Jenna. Sorry to hear the full extent of all you have had to go through. I know you're scared and don't know what it will be like to endure this process, but you have done the right thing to seek help and it looks like you are starting to get some real answers. Thank you for sharing. You are right that we are very aware of carpal tunnel, and despite my bot-like behavior, we are human, and I watch for signs often. I will be especially attentive to any oddities thanks to your story. Good luck! Wishing you the best. My doctor is recommending the same surgery after an injury from a car accident. How bad was the process/recovery etc? Trying to put it off, but researching this tells me to do it ASAP. That was a very close information. I am opting for Hand Surgery in Phoenix before that am collecting information on this. Thanks for sharing. Keep exploring.